Now, what does that mean, truly, and why does it matter? For the past four years, as a member of the Cal Poly, San Luis Obispo community, this experience has been something else. 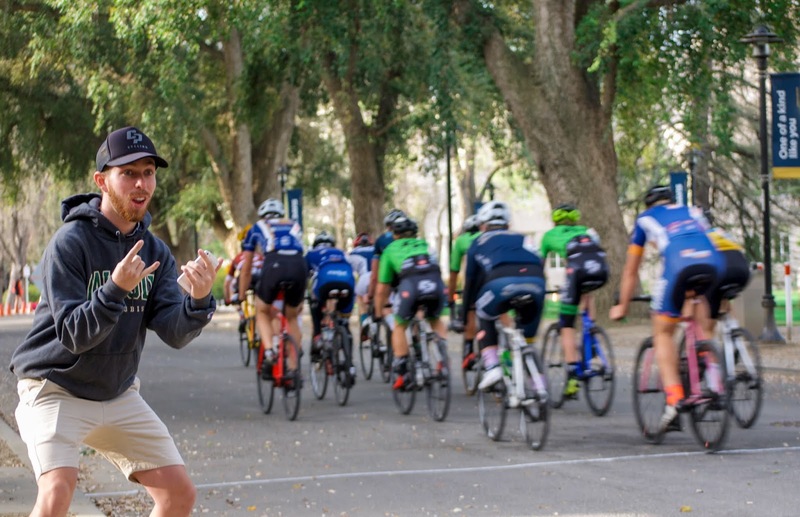 While engaging in campus life, local events, and the San Luis Obispo scene, my experiences have been drastically altered by Cal Poly Cycling. Now, as a graduating senior, when considering my time at Cal Poly, memories are filled with thoughts of weekend getaways, adrenaline rushes, and quality conversations, all with Cal Poly Cycling. No weekend better sums this feeling up than April 14-15, 2018, for a weekend of collegiate road racing hosted by Stanford. The van. Oh, this weekend, it all started with a van. Operated by Reed Williams, a first-year student at Cal Poly, this piece of machinery was a talking point, while being on another level. While it only made an appearance at one race weekend in 2018, eyes were peeled and heads were turning when this beast rolled into registration on Saturday morning. Soon, friends from other teams were flocking to us, as we hunkered down and began some sort of pre-race routine. Naturally, this included heaps of humor, trash talk, and blaring music. This van, as well as other Cal Poly Cycling owned vans, proved symbolic. 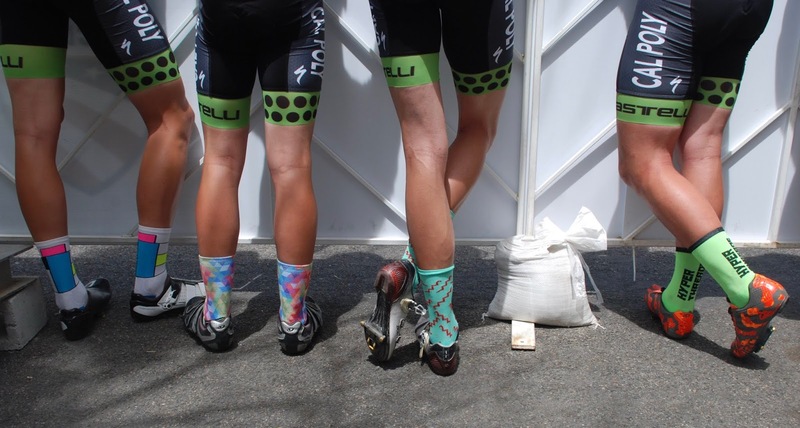 This year, as with most years for Cal Poly Cycling, we were going to do things our way. Loud, proud, and willing to turn heads, this is Cal Poly Cycling. At the Stanford collegiate road racing weekend, a road trip north landed us at Laguna Seca, a famed raceway in Monterey. Our homes for the weekend included a hodgepodge of vans, tents, and hammocks. While sleeping in the dirt and cooking on propane-burning stoves, this is where we're at home. This is where the conversations begin rolling, and this is how teams are built. On both Saturday and Sunday, racing went well for Cal Poly Cycling, with an array of solid results and appearances atop bland paper speckled with dark lettering. While a piece of the experience, it was refreshing to continue throwing down, all while running a limited operation. This is collegiate cycling, a piece of the college experience. From a weekend of racing at UC Davis, collegiate races are often strung out, with few bland moments. With racing, at the end of the day, this is a portion of something bigger. 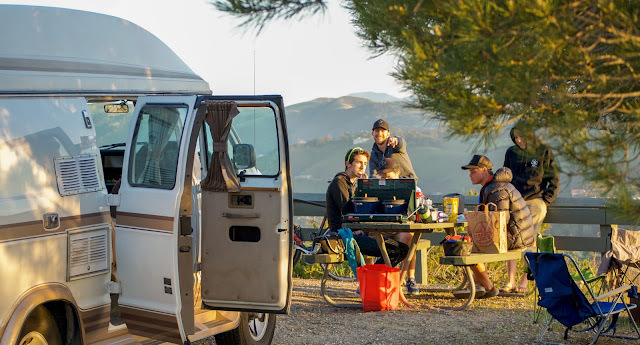 Whether waking at 3:30 a.m., as a junior, to drive with my parents to competitions, or driving through the night, with a van load of friends, to attend collegiate national championships, time spent with others is valuable. There's something about two wheels, a rush of adrenaline, and the flow of endorphins that sparks connection, conversation. 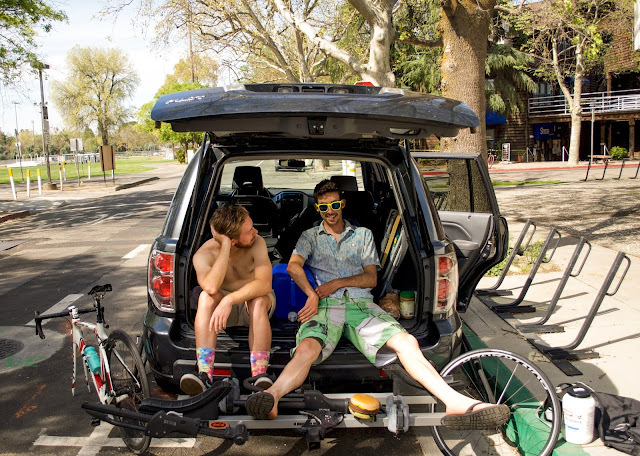 Two dudes, another road-trip vehicle, and a hamburger saddle bag. 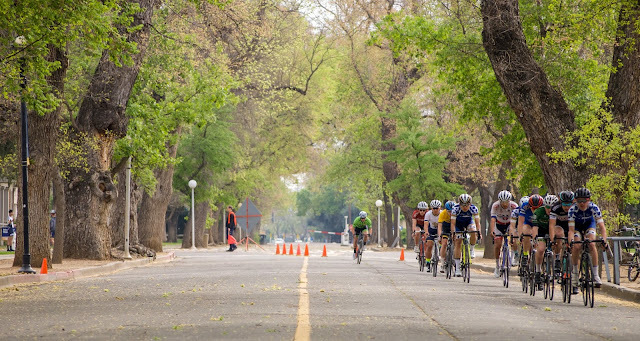 Whether it's racing or exploring on two wheels, outside of California or in San Luis Obispo, Cal Poly Cycling, and the power of two wheels, has been a drastic influence on my experience at Cal Poly. The bicycle, as well as the Cal Poly Cycling organization, allow for life-long connections, endless exploration, and plenty of time spent outside. Lifestyle: "the way in which a person or group lives." This is our lifestyle. With this lifestyle, sock game is a point of focus. Photo: Dustin Stiffler.